A group of witches in Brooklyn, New York, plan on gathering to place hexes on recently appointed Supreme Court Justice Brett Kavanaugh on Saturday, October 20, 2018. The planned event has already received quite a bit of publicity. The Guardian and Newsweek, Time Magazine, and other publications have run articles on it. The event is being hosted by Catland Books, “Brooklyn’s premiere occult bookshop & spiritual community space” (according to their website). Tickets are being sold for $10, with 50 percent of the proceeds going to support Planned Parenthood and the Ali Forney Center, which is an LGBT community center which focuses on helping homeless LGBT youth. As the Guardian points out, the event is not atypical of Catland Book’s event schedule. 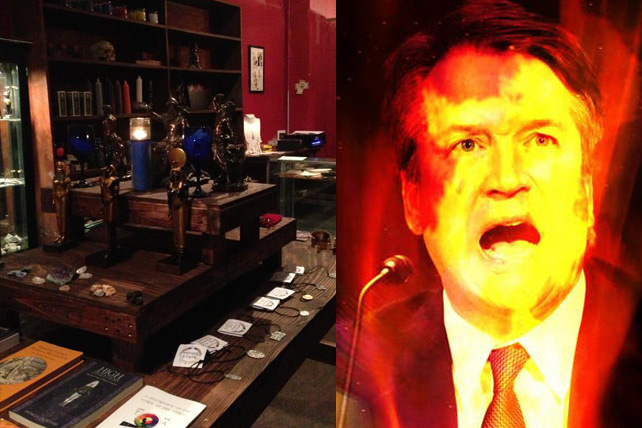 Previously, the store has hosted events to hex President Trump. While it’s doubtful the majority of left-leaning voters would support such an event, co-owner of Catland Books, Dakota Bracciale, hopes the event will galvanize the left. “The whole thing is going to be really cathartic, whether you believe it or not. The right has churches but the left is scattershot. The left is where you’re going to find atheists, secularists, humanists, people who follow non-traditional religions. So how are you going to get all of us together in times of trouble? That’s what we’ve been doing,” Bracciale told the Guardian. Bracciale went on to explain the bookshop hosts less occult-focused events such as traditional protests and voter registration drives, but they have found putting an occult emphasis on events has been effective for them. “It strikes fear into the heart of Christian fundamentalists,” she says.